For the last six months I've been using an A5 filofax as a diary, notebook and book tracker. It's worked pretty well, although I had to resort to using a backpack walking to work so my shoulders didn't end up as lopsided as a galley slave. Then I bought a beautiful new handbag, which was big enough to hold the A5 without complaint. Which was fine, for the handbag. For my shoulders, not so much. 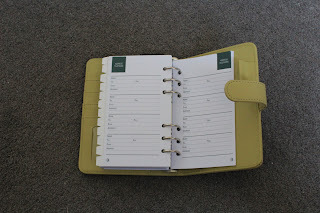 I started to empathise more and more with everyone else suffering planner failure, and stopped using mine the way I need to. So far I haven't forgotten anything really important, but I'm already losing track of bills and things, so I decided to do something about it. It's not a Filofax-branded binder. It's made by an Australian company called The Last Diary Company, and was far, far cheaper than Filofax. This one is actually the second - the first one was unwrapped in the car and promptly returned because a couple of the rings were separated. This one has better rings, and they're easier to open. The address sheets have the contact details together, and the address at the bottom of each name! Most of my contacts are name, number and email, and every other address sheet has the address in the middle, making it hard to skim through when you're in a hurry. Will definitely be keeping these ones, and copying blanks. There are A-Z dividers, which I probably won't use, and no section dividers, so I'll be adding those along with a different diary layout. In fact, it's going to be completely gutted and personalised. My A5 dividers are the wrong shape to cut down, so I'll be starting again from scratch. Time to start playing with art supplies! 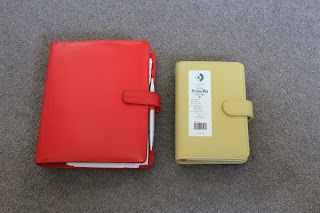 I'm in the complete opposite situation to you; recently expanding from a personal into an A5 because I need more room to breath for extensive planning, drafting and freelance. I look forward to seeing your art supplies! I'm still in love with my personal, but it's not exactly living up to its name just yet. 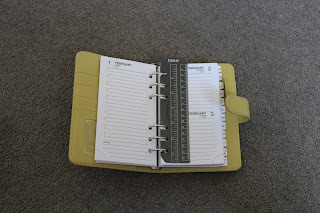 Filofax default inserts can be so cold without a bit of TLC.